Federal numbers released quietly by the government late last month are painting a bleak picture of Canada's financial future — one filled with decades of deficits and a doubling of the national debt to $1.5 trillion by 2050-51. Federal numbers released quietly by the Trudeau government late last month are painting a bleak picture of Canada's financial future — one filled with decades of deficits. The report, published on the Finance Department website two days before Christmas, predicts that, barring any policy changes, the federal government could be on track to run annual shortfalls until at least 2050-51. If such a scenario plays out, the document says the federal debt could climb past $1.55 trillion by that same year — more than double its current level. 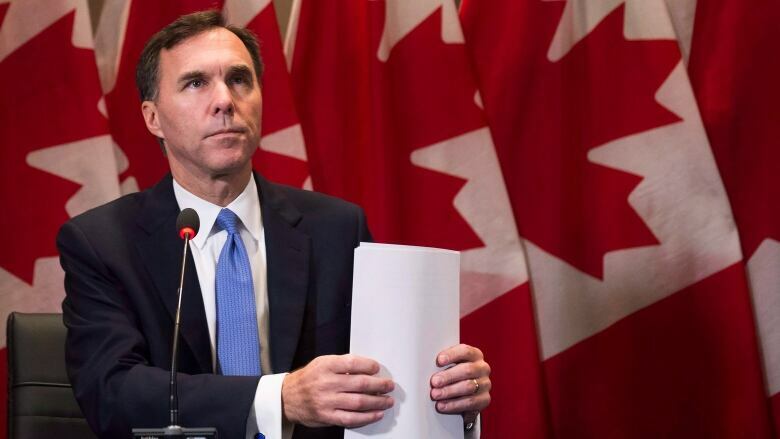 The projection comes as the federal Liberals proceed with plans to run annual deficits over at least the next six years as a way to help Ottawa fund an economy-boosting effort that includes infrastructure investments. Over the long haul, the fiscal trajectory in this report looks dramatically different when compared to similar long-term federal predictions released in November 2014 by the previous Conservative government. Those 2014 projections were released as crashing oil prices were only beginning to wreak havoc on the economy. In both cases, the government stressed that its projections were intended to represent a plausible baseline and were not forecasts because such long-term estimates contain considerable uncertainty. "They are intended to provide a broad analysis of the government's fiscal position, to allow the government to respond more effectively to upcoming challenges and protect the long-term sustainability of public finances," the December document said. To help explain the prediction, the report points to the major economic challenge caused by the gradual retirement of baby boomers. The demographic shift is expected to shrink work-force participation, erode labour productivity and drive up expenditures for things like elderly benefits. For the first time in the country's history, it adds, there are more people aged 65 and older than there are children under 15. But citing the distant horizon of the outlook once again, it says the eventual outcomes could turn out considerably better or worse than today's projections. For example, the document estimates policies that successfully boost labour-force participation and productivity over the coming decades have the potential to increase economic growth by as much as 22 per cent by 2055. The report projects the federal government will produce deficits of $25 billion in 2025-26, $36.4 billion in 2030-31, $38.8 billion in 2035-26, $33.9 billion in 2040-41, $21.6 billion in 2045-46 and $2.2 billion in 2050-51. Ottawa's books, it predicted, would see a surplus of $26.5 billion in 2055-56. The 2014 long-term projections were far more optimistic. They predicted double-digit annual surpluses until 2050-51 — a year Ottawa's balance sheet was projected to finish $220.4 billion in the black. The "federal debt" category that year was instead expected to show assets of $1.7 trillion. Since the fall of 2014, the national economy has faced significant challenges, especially from the prolonged oil-price slump. The Liberals won the 2015 election on a plan that would allow them to spend billions on infrastructure projects as a way to improve the lacklustre growth, financing it with annual deficits of no more than $10 billion over the first couple years of their mandate and promised to balance the books by 2019-20. Once in office, the Liberals abandoned those so-called "fiscal anchors" as the economy continued to absorb a beating from collapsing oil prices. The Trudeau government has since promised to lower the country's net debt-to-GDP ratio — a measure of the public debt burden — from today's level in five years. In November, Finance Minister Bill Morneau's fall economic and fiscal statement predicted a deficit of $25.1 billion this year. The annual shortfalls are gradually expected to shrink over the coming years to $14.6 billion in 2021-22. The sudden publicity surrounding the latest projections prompted an unsurprising broadside Thursday from the Opposition Conservatives, who relish portraying the Liberals as irresponsible fiscal custodians. "In 2015, (Prime Minister) Justin Trudeau ran on a platform pledging transparency, openness, and with the promise to return to a fiscal surplus by 2019," said Tory finance critic Gerard Deltell. "Now after just more than a year of Justin Trudeau, Canadians are looking at deficits as far as the eye can see."